Sono compresi i consumi di acqua,luce e gas. Per le pulizie finali dellappartamento sono richiesti 50 euro. Allarrivo è richiesta una cauzione di 150 euro (la cauzione viene restituita al check-out dopo un controllo della casa). S.Antioco loc. 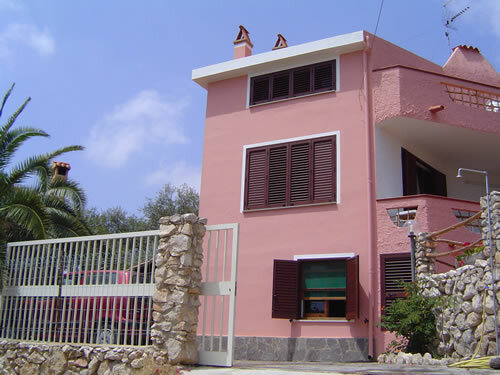 Maladroxia: lovely apartment with a beautiful sea view at 200 mt to the beach. The apartment has: dining room with kitchenette, 1 double bedroom with bathroom,1 bedroom 1 bed,1 bedroom with two twin bed, one bathroom with shower, nice terrace with external furniture. The utilities are included. The final apartment cleaning charge is 50 euro. On arrive its required a caution deposit of 150 euro (this deposit will be returned to the client at the end of the stay, provided everything in the unit is in good order). stoviglie, biancheria da tavola, riserva idrica autonoma, frigorifero, lavatrice, tv, barbecue,ferro da stiro, parcheggio privato per 1 auto. frigo, kitchen equipment, water reserve, tv,washing machine, private parking for 1 car.